Stugeron Travel Sickness Tablets: Travel sickness can be a real pain but these tablets can help you feel less queasy and more ready for the journey ahead. 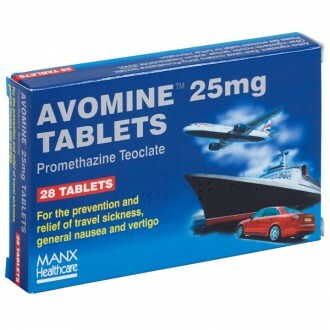 Whether you are travelling by plane, car, boat or train, these travel sickness tablets will work to prevent and treat travel sickness while also ensuring you are more alert. 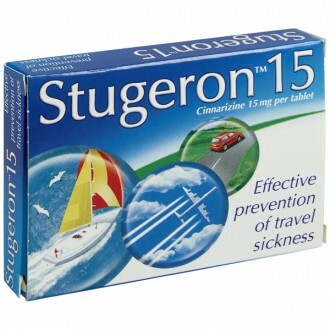 Stugeron is a travel sickness tablet containing the active ingredient cinnarizine. Cinnarizine is an antihistamine that reduces symptoms of travel sickness, regardless of the cause. Stugeron tablets can treat the symptoms of vomiting, nausea, dizziness, vertigo, and ringing in the ear (tinnitus) that is associated with middle ear disorders. Stugeron tablets contain 15 mg of the active ingredient cinnarizine. This is an antihistamine that stops nerve signals from triggering the vomiting centre in the brain. These signals are sent by the vestibular apparatus at the inner ear, and preventing them from reaching the brain suppresses symptoms of travel sickness. The vestibular apparatus is sending the brain information on the body's position. When the head is moving a lot, such as when travelling by car or plane, these signals can trigger the vomiting centre in the brain. This causes symptoms such as nausea, dizziness, vertigo, or vomiting. The way cinnarazine works is by blocking histamine receptors in the vomiting centre of the brain. This means that any nerve signals sent to the brain by the vestibular apparatus will not activate the vomiting centre. You can chew or swallow Stugeron tablets. Stugeron can cause stomach upsets. Taking the tablets with or after food may reduce this effect. Don't take more than the recommended dose of Stugeron tablets. Cinnarizine may reduce the effects of histamines (which can be used to treat leukaemia) and betahistines (which can be used to treat Meniere's disease). Sometimes, it can be difficult to obtain prescription medication when abroad. The Online Doctor can provide a variety of medicine that will be useful when travelling. These medicines can be ordered online using a trusted and reliable service. To avoid travel sickness, try to remain seated and facing forwards whilst travelling. To suppress nausea, try focusing on a single point on the horizon. Take 2 tablets, two hours before travelling and 1 tablet every 8 hours thereafter if needed. 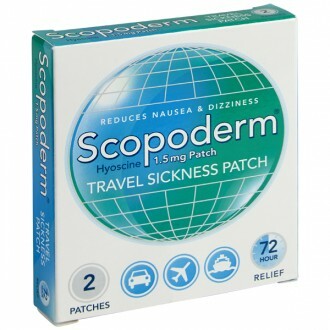 Take 1 tablet two hours before travelling and half a tablet every 8 hours thereafter if needed. Maize starch, lactose monohydrate, talc, sucrose, povidone and magnesium stearate. Stugeron tablets are used to treat nausea and vomiting that occurs due to motion sickness or other causes. Its active ingredient is an antihistamine called cinnarizine. Motion sickness and vertigo occur when the brain receives certain signals from organs in the middle ear. Cinnarizine prevents these nerve signals from reaching the brain by blocking certain muscarinic receptors. What are the side effects of Stugeron? The most common side effect of Stugeron is drowsiness. You will be most at risk of this side effect if you are also taking another medicine which causes drowsiness. Always inform us of any other medicines which you are taking so that we can help to minimise potential side effects. How long does it take for Stugeron to become effective? Stugeron works gradually. From the time you take the tablet, it will take 2.5 to 4 hours in order to reach its full effect.